Inspired by the life of Saint Felix, this fanciful tale tells how the course of one man's life is changed by one of God's tiniest creatures. Based on the story of this third century martyr and his escape from the Roman persecutors. Here are some interesting facts about the creatures in St. Felix and the Spider! 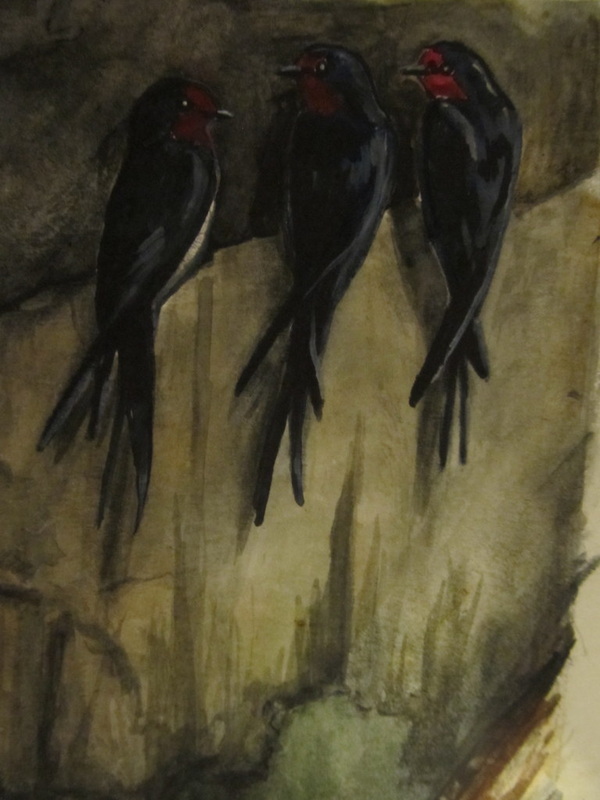 These are the Old World subspecies of the same swallow found all over the States. Barn Swallows are customarily found nesting in buildings, but they can also fasten their mud nests to the walls of caves. This European Robin (Erithacus rubecula) lives in a tree outside Felix's cave. It gets all excited when the Roman soldiers invade its territory. Our American Robin was named after this species because of its red breast, but the two are otherwise quite different. The European Robin is much smaller, only around 5" and its color is mostly brown. But how sweet it is that England's favorite bird has a namesake in the American Colonies. 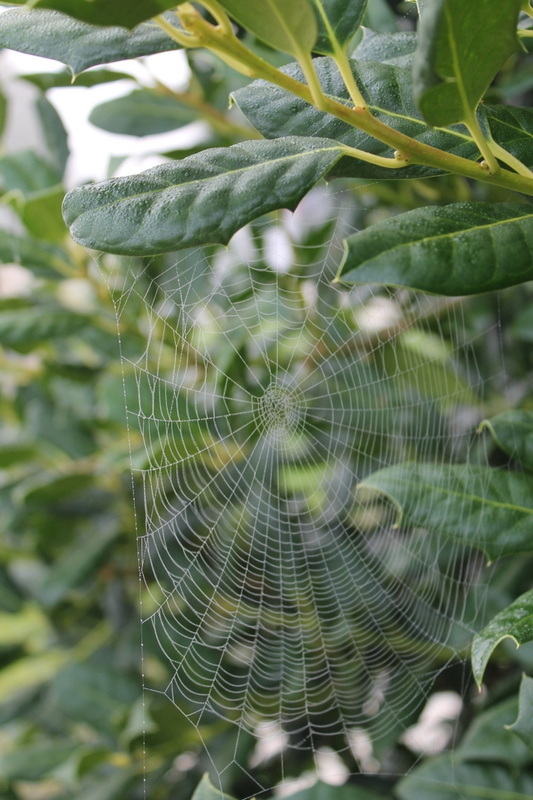 This is the web of an orb-weaver spider such as Fidelis is in the book. Eurasian Green Woodpecker (Picus viridis) is a fairly large bird about 12" long. It lives in the woods, but also needs open spaces to feed because it mainly eats ants on the ground. This bird is found in all of Europe and much of Asia. Golden Eagle(Aquila chrysaetos) and Egyptian Vulture (Neophron percnopterus). The Golden Eagle is a huge bird with a wingspan that can reach over 7 feet. This species also lives in the US. The Egyptian Vulture is a smaller African & Eurasian bird, but very striking as it has a bald yellow face. The Egyptian Vulture is now an endangered species. 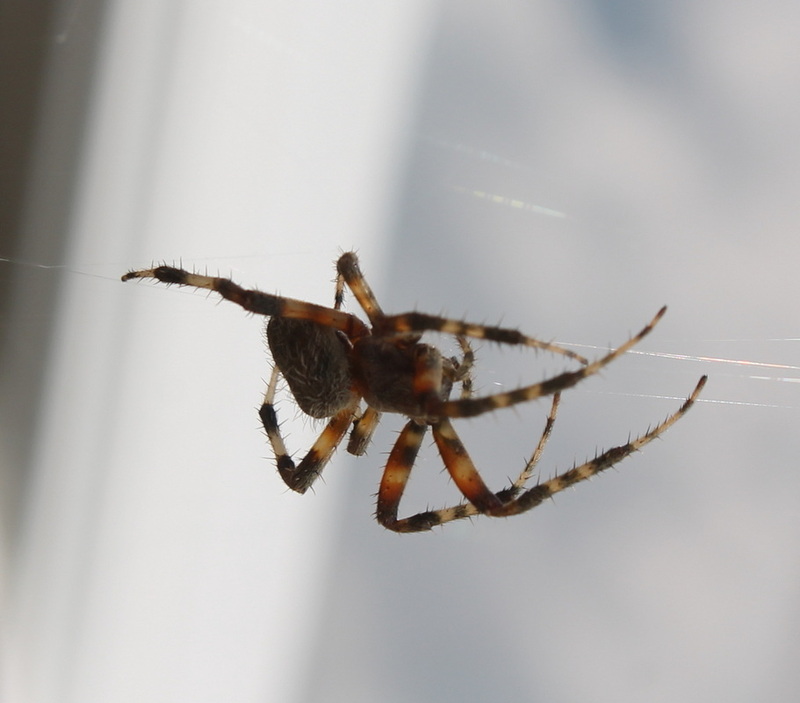 Fidelis is a Garden Spider (Araneus diadematus) also known as a Cross Spider. This species is native to the Old World, but also has been introduced in this country so there were plenty of live models on hand. European Goldfinch (Carduelis carduelis) Some of the huge flocks of Common Cranes are passing by on their winter migration. Eurasian Wren, also just called Wren (Troglodytes troglodytes) . Troglodytes means 'cave-dweller'. This is a tiny bird only 4" long. It also lives in the United States, where it is known as the Winter Wren. Here is one of my models: Timothy Stedding, Esq. 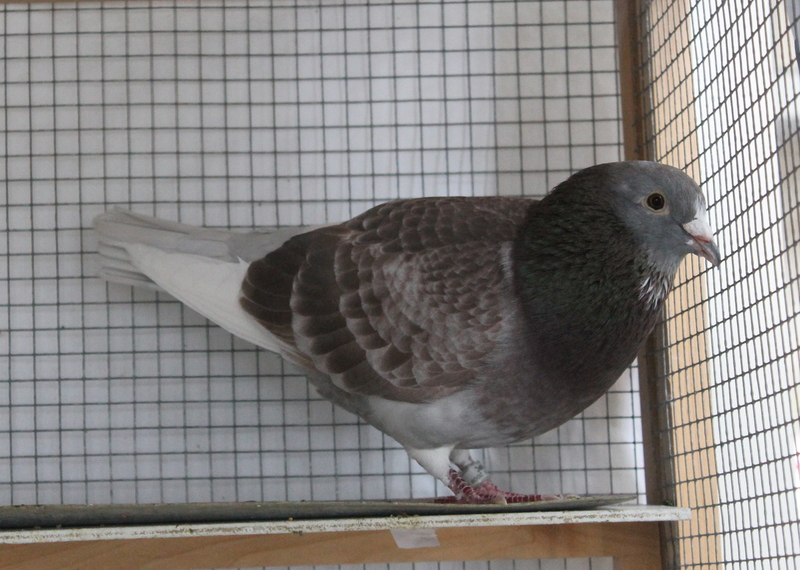 My pet pigeon whom I put in the book three times. Timothy gossips with an ancient Roman pigeon. There were domestic pigeons even back then. 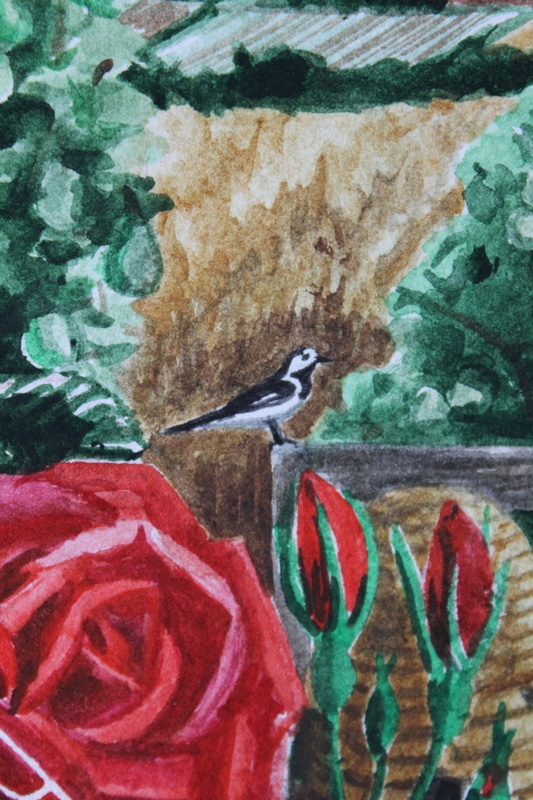 Being a birder, I put birds in every picture in the book! The White Wagtail (Motacilla alba) lives year round in Italy. It is a long-tailed bird about 7" long of the open fields, and is also often found near human habitation such as little Roman villages. The wagtail is a ground-dwelling bird which feeds on insects. Found all over Europe and Asia, the White Wagtail barely makes it into the US on a little bit of Alaska.